Learn More Buy Your Copy Today! Get videos and articles sent to you that advance your efforts to forge your new identity in Christ. Frank, Faith of a Father is a breath of fresh air in contemporary writing on faith and self-understanding. As I read your story, I found, at least in part, that I was also reading my own. And, as I found my story, I also found insight into who I am and how I think. Thank you for having the courage to write it and share it with us. With gripping honesty, Frank explains the weave of the trauma of his youth and his quest for truth. Faith and the narrative of Christ surface as true, good, and beautiful. Rarely does someone write with such clarity and vulnerability. Tears came to my eyes many times as I read—tears of sorrow and of joy. Readers will be inspired to dive more deeply into their own story and emboldened to wrestle intelligently against fallacious and faithless theologies. Frank’s vulnerability is a gift—to his family . . . and his readership. 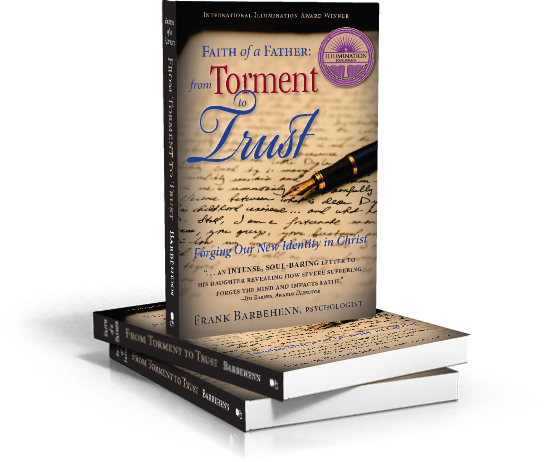 Frank Barbehenn’s articles, Coach’s Corner, books, downloads, DVDs, booklets, study guides, and any other materials offered here represent a combination of his own personal opinions, professional experiences, theological expertise, and church leadership experiences. Consistent with the ethics of his profession as a psychologist, none of the materials offered here are intended to be professional psychological advice for your specific life situation. That is, any interaction with him–including blogs–does not constitute a professional therapeutic relationship. For professional and customized advice, you should seek the services of a counselor or psychologist licensed in your particular state who can dedicate the hours necessary to become more intimately familiar with your specific situation. Frank Barbehenn does not assume liability for any material on any blog associated with this website. He does not assume any liability for damages or injuries resulting from your decision to interact with the website or anything on it.